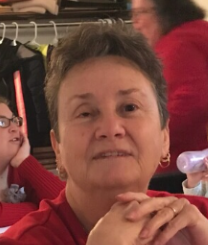 NANCY MARGARET SULLIVAN, 67, of Huntington, W.Va., went home to be with the Lord on Friday, April 12, 2019. She was born September 3, 1951 at Huntington, a daughter of the late Boyd and Elizabeth Caldwell Clark. She was retired from Corbin Industries in Huntington and a member of Garrett's Creek Community Church. Survivors include two sisters, Marie (Richard) Dummitt of Wayne, W.Va., and Belva (Tom) Martin of Genoa, W.Va.; one brother Ronald Dale (Stella) Clark of Wayne; five nephews; one niece; and a host of special friends too numerous to mention. Funeral services will be conducted at 1 p.m. Monday, April 15, 2019 at Johnson Tiller Funeral Home with Pastor Greg Johnson officiating, with the visitation beginning at 11 a.m. Private burial will follow.